Please read the guidelines before reserving a room. Study rooms are free for non-profit, community and for-profit/business groups regardless of their beliefs or affiliations. If you have questions, please contact Arapahoe Libraries. Please check in with a staff member when you arrive to confirm your reservation. 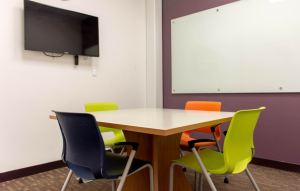 Study rooms are available to groups of 6 or less. Study rooms may be booked for a maximum of 3 hours per day per group. Study rooms are available on a first-come, first-served basis. They may be booked in advance online or by calling 303-LIBRARY (303-542-7279). Groups should notify Arapahoe Libraries 24 hours in advance to cancel. If a group has not arrived or called to report a delay within 15 minutes after the scheduled time, staff may allow others to use the room. Study room reservations can be made for the current month and the following month. On the 1st of the month, the following month will open for reservation online at 7 am. Study rooms may be booked by persons of any age. Light snacks and covered drinks are allowed in the study rooms. Tobacco products and alcohol may not be used anywhere in the library. All groups are responsible for setup and cleanup. Facilities must be left in a clean and orderly condition. Users must pay costs for repair of any damage incurred. Arapahoe Libraries is not responsible for materials or equipment left in the study room by the user(s). Permission to use study rooms does not constitute endorsement by the Arapahoe Libraries staff or Board of Trustees. No advertisement or announcement implying such endorsement will be permitted. Arapahoe Libraries, at its sole discretion, reserves the right to revoke meeting and study room privileges at any time. Any advertisement or announcements regarding reservable spaces may not include the Arapahoe Libraries logo or suggest co-sponsorship and needs to contain the following disclaimer: "Granting of permission by the Arapahoe Library District to use library facilities does not constitute endorsement by the Library District staff or Board of Trustees." How far in advance can I reserve a meeting or study room? Can I have a meeting catered at the library? Where can I find how to reserve a room on the website? How do I reserve a meeting or study room?